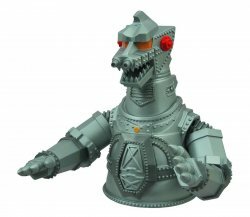 Trust your money to Godzilla! 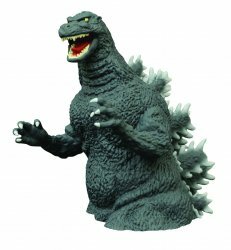 Vinyl Bust Coin Piggy Bank, as Godzilla appeared in the 1989 film Godzilla vs. Biollante. A Diamond Select Toys release sculpted by Gentle Giant Studios! Is he monster, or hero, or both? This 10-inch bank of the city-destroying and alien-fighting lizard called Godzilla is based on his appearance in the 1989 movie Godzilla vs. Biollante! Cast in sturdy vinyl, the bank features a coin slot in his back, as well as an access door in the base. Collectors Note: Packaged in a clear polybag.